This Taonga is called ‘kī of Life’. Symbolised within this creation is the unlocking of great treasure. The greatest treasures are found deep within our heart. When we open our heart to the light of divine wisdom, the key of freedom and liberation abound. A key is a popular gift to give on important birthdays such as the 21st. It symbolizes opening doors for a brighter future. For example, doors to a successful career and new possibilities. However, the greatest capacity for a happy future comes though using the key to open the door to correct spiritual paths. This happiness is meaningful and enables us to take the essence of this precious human life. 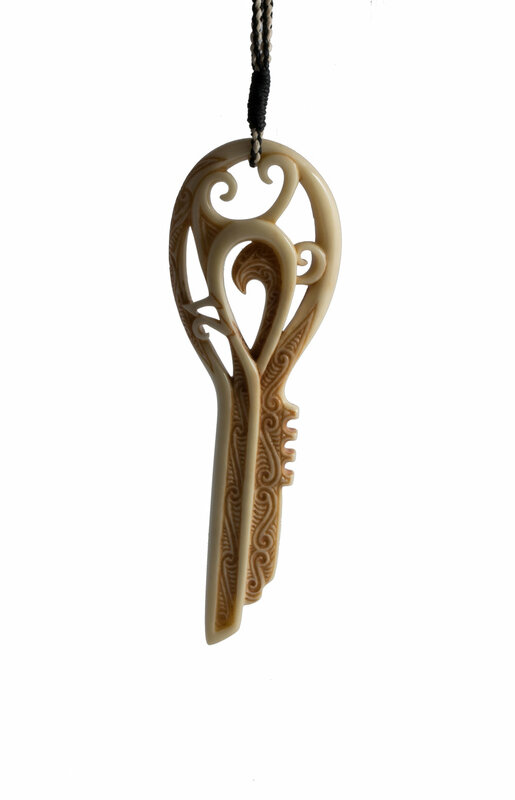 These are symbolised by the three carved out koru at the top of the key. These surround the heart of the key which symbolises the coming together of their life essence. The continuation of their blood lines within you. This is depicted by the innermost koru covered with the motif that shows the awakening of great secret knowledge held at deep within our heart. It is the innermost part of our ultimate nature. This is surrounded by the protection circle. True protection comes from doing what is correct, what is right, and abandoning what is incorrect. Through developing the pure minds of love and wisdom. The four double-koru at the bottom of the body of the key represents the four great practices of attainment. Purification, refuge, making requests and receiving blessings. The Koru running along the top of the main body symbolise a journey. The markings in-between show that each aspect of our journey is interconnected through cause and effect. There is a motif on the outside of the top of the key. This shows our skilful means to reflect peace and benefit into the outside world and environment. On the back of the carving there is a corresponding motif which is not stained. This symbolises that it is the purity of our heart and mind that is being reflected. The other inside pattern opposite, displays the aspect human life being more of an inner journey, not an outer one. As such, many understandings are to be held secret and close to the heart so not to invite discord, or harm among the worldly. This pattern contains three koru that bestow blessings of body, speech, and mind. There are many other levels of meaning that can also be understood from this Taonga. I sincerely hope you enjoy the carving and over time come to fully understand all the various layers of meaning imbued in this creation. I wish you and your whānau the deepest peace and happiness.